Extremeley high quality cruising auxiliary, built in 1981, classed Maltese Cross 100 A1 LMC and constructed by the noted Williams Yard in Falmouth, England. Love of Liberty incoporates the favored aspects of some of the most respected and well proved sailing vessels of our time. Her designer and sole oner dew upon 40 plus years of racing and cruising experience to conceive this attractive, spactious, comfortable, and versatile offshore sailing vessel. PLEASECONTACT US FORRECENT SURVEY!! 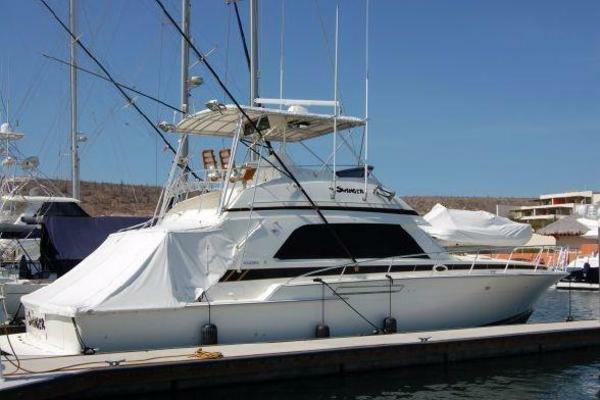 United Yacht Sales New Jersey would love to guide you through a personal showing of this 48' Custom Auxiliary Cutter 1981. This yacht for sale is located in Stonington, Connecticut and priced at $195,000. For a showing please contact us by filling out the form on this page and we will get back to you shortly! This design, for my own use, reflects many idiosyncratic features that emphasize the unique value of a total custom design. Dominant amongst these is the indulgent arrangement of the accommodation (for the singular comfort of my wife and myself), a luxury of space one does not often have the opportunity to enjoy in a boat this size.Emphasis is about equally divided between passage making and harbor comfort, both for extended periods, consistent with the life-aboard purpose for which the boat was intended. Because our cruising was focused primarily within tropical climate areas the accent is upon light, airy, open space served by oversized dorade ventilators, all with an alternative strait thru venting facility, large double action hatches with spray/rain hoods as well as large opening ports. However, there is a solid fuel, soap stone heater stove common to the main saloon and head compartment to combat dampness and provide warmth to the spirit as required. We have found this psychic requirements to rank equally with function.Below decks, functional emphasis has been concentrated upon the navigation and galley areas, each adjacent to the companionway and divided longitudinally, which is intended to make life easy, offering total body mobility, and eliminating the confinement of a safety belt without sacrifice of security. This facility derives from the general arrangement running fore and aft with the major division being provided by the engine box- sink counter along the center line. By usual standards an inordinate amount of space has been devoted to both galley and navigation areas. I have found the pleasures and benefits to be in direct relation to their adequacy and easy of operation underway.Because the entire engine box - counter pivots up away from the engine total access to it and ancillary mechanicals is provided.Total-easy-access is a conceptual feature throughout.The port side main saloon settee slides to extend in width, forming an alternative double berth. The toilet/shower area is large to provide an expansion of the forward stateroom with which the basin is ensuite when the main saloon door is closed, the w.c. remaining concealed behind the other door. Proivision for all forms of stowage is abundant. Clothes drawers are camphor lined.A somewhat unconventional feature of layout is the great forecabin with athwardships double berth to which my wife and I are partial. We have found the forward location to be cooler in the tropics and equally as important it permits an improved monitoring of ground tackle performance. Off-watch underway sleeping is normally in the quarter berth and / or to leeward in the main saloon, except under/power when the forward berth has proven to offer a most quiet and comfortable situation.The deck and cockpit layout is appropriate to short handed sailing with wide side decks providing for enhanced ease of movement and for full length streth out comfort in a deep cockpit, the forward end of which is protected by a permanent shelter.There are proper bulwalks for secrutiy, a flush deck forward for dinghy stowage and a trunk foc'sle hatch scuttle for dryland easy sail handling and access.The Rig is simple and strong, by Hood, U.S.A. as are the sails. the Cutter sailplan was selected as the best solution by wich to optimize simplicity and ease of handling with weatherliness complete with an easy motion deriving from a placement of the mast relatively further aft than usual. The club staysail boom on pedestal provides self-tacking facility for the working jib with the inner stay released. A nice short handed rig.Her relatively large sail plan coupled with relatively low wetted surface sections provide plenty of power for lightgoing. Likewise, she has proven to be "right on" with the design criteria to avoid reefing down and shaking out in the awkward ranges between 15-20 knots. She can carry full main and 120% genoa to windward up to about 20-22 knots apparent, depending on the Seastate at which point on reef should be taken in the main. This keeps the rail comfrotably out of the water. Accordingly, she remains dry in a seaway ye tmaintains about 7.5 knots on the wind and upwards of 8.5 knots reaching. She'll do about 6-6.5 knots in 8 knots of apparent wind, so without any sacrifice in docility or ease of handling she evidences quite impressive performance.Non-dimensional design parameters are all moderate with displacement biased to the upper end to permit practical sail and load carrying capacity requirements without distortion to sailing lines which are symmetrical in character, accentuating self-sailing balance.The basic hull form is very easilty driven, emphasizing sea kindliness and stability and optimizing low wetted surface and an easy motion with sail carrying ability, especially thru the awkward variable ranges resulting in fewer sail changing demands and less fatigue upon boatgear and crew. It is my convition that these features combine to not only permit more tolerance when conditions are not perfect but contribute to the increased pleasure of shorthanded passage making at all times.In addition to the serious consideration of seaworthiness the boat is fun to sail, highly responsive without sacrifice of directional stability which qualities, of course, carry over to efficiency and high manoeuvreability under power as well.Construction is airex cored GRP build under Lloyds supervition, substantially in excess of their requirements, and upon completion of fianl trials was classed + 100 AI, LMC.Execution by Williams Boatyard, Falmouth, Cornwall was absoutltely flawless in all respects. With impeccable craftsmanship they have acheived the timeless look of classic quality.The design style is intended to be a declaration of what custom design is all about. She is a tasteful crusing yacht, originating from experience, executed with finesse, of generally traditional shape and proportions but respectful of contemporary hydro and aero dynamic principles, altogether evidencing a character that harmonizes underlying strength with a finely detailed appearance.There are few straight lines. The sheer is bold, uniting with the clipper bow for dryness going to windward and providing buoyancy from flare emanating from a fine entrance. The stern confers a balanced profile, provides a pleasant fantail deck and carries thru the double ender hull form with a moderate overhanging counter that not only offers added sailing length and buouyancy, but as well provides a signature stern that additionally is a strong one in GPR.In addition to aspects of structure, utility and performance, the design concept included intangible objectives, both aesthetic and philosophic. The object was to produce and expression of symbolic content evoking sensations that are a part of the romance of sailing, which was intended to be implicit throughout without undue sentimentality, reflecting a restrained and tasteful expression of individuality. The realizaiton of those objectives was accomplished by those who collaborated in her building and derived from a caring and dedicated spirit that goes beyond skill training in their reach for the highest standard of excellence.The result is testimony to the fact that creation of quality is the ultimate luxury that committed men can achieve. Love of Liberty is a well-traveled sailing vessel and has proven to be exceedingly comfortable in a seaway, is swell balanced, directionally stable, responsive and close winded. 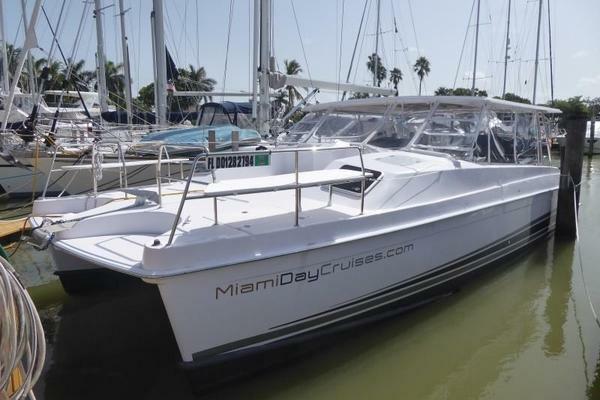 Since launching, she has safely taken her owner over countless miles of open water including the Mediterranean, English Channel, Brittany coast, Caribbean, and Pacific Northwest. Her hull has a simplified clipper bow with rounded canoe stern, elegant sheer with a moderate Deadrise and easy round bilges. She has a cutaway forefoot shallow keel with centerboard, separate skeg protected semi balanced rudder. The deck layout is simple, yet very functional. A deep cockpit offers comfortable seating, and is especially accommodating under demanding sea conditions. Her teak flush decks have generous camber, are easy to move about and the placement of deck fittings is well thought out and very practical. A simple, very strong, single spreader mast; cutter rigged is placed well aft to facilitate to the boat's easy motion in adverse conditions.Below decks, Love of Liberty combines a well-designed, open, airy atmosphere, replete with ample storage for extended live aboard suitability and passage making. The interior is beautifully executed in hand rubbed varnished joiner work, which includes species of teak, pine, cedar and spruce with a painted V groove main and teak aft bulkheads. The quality of the joinery is that which is only found on custom yachts. Locker doors in the main salon and forward cabin are raised panel. Overall, the boat has a very New England styled interior that exudes traditional charm.An exceptional galley lies to port that is very easy to manage, even in the worst of sea conditions. Opposite the galley to starboard is a full sized navigation table with chart stowage below. A single quarter berth is aft of the chart table and serves as seating for the navigator. A large salon is complimented with transom berths port and starboard. The port berth pulls out to a double. On centerline is a birds eye maple wood finished dinette table with drop leafs on each side. A Luke Soapstone solid fuel cabin heater with elegant tiled heat shield is against the forward bulkhead. The head lies forward, is very large and functions in such a way to incorporate the sink basin counter and additional area into the forward cabin, providing privacy from the main salon, yet closing off the water closet. The forward stateroom features a 54" wide double bed and has proven to her owner to be the most comfortable berthing while underway. It is the preferred location while under power and is remarkably comfortable in trying sea conditions while beating to windward. A generous foc'sle accommodates all the boat's unbent sails, awning, spare inflatable dinghy, spares, and bosun’s equipment. The chain locker is self-stowing and completely accessible.Ventilation is provided through six opening ports on the cabin trunk, five opening deck hatches, and six Dorade vents. Her Airex cored hull and deck provide and insulated environment which stays cool in the tropics and otherwise totally free of condensation. Shaft Type - S.S. 1x3/8"